Thinking of Starting a Business helps your client consider what makes a successful business start up. It shows the importance of having a clear vision and values and explains what skills you need. It also prompts them to think about what sort of business matches their personal circumstances and lifestyle. What makes a business successful. The importance of having a clear business vision and strong values. What skills a business owner needs. What type of business fits with their business idea and personal circumstances. The workbook takes a simple, step-by-step approach and includes 12 integrated worksheets that build towards an action plan. Plain English caters for all reader levels. The 12 worksheets build towards an action plan. Numbered steps make sections easy to follow. Full-colour printing and illustrations add a ‘light touch’ feel. Boxouts contain tips and useful resources. 52 pages, full-colour, illustrations, 12 worksheets and action plan. 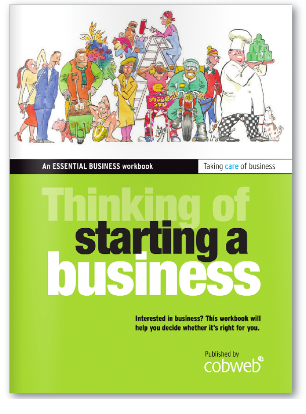 Interested in using this workbook with your clients?